NEW! Download PRITCHETT's free book, Lessons from a 1,000 Deals, to learn about high-payoff guidelines for managing M&A integrations. Before a deal closes, the acquirer's senior executives should agree on a set of M&A integration principles that will help direct the actions of their integration teams. Explicit guidance on M&A integration fundamentals gives people a collective sense of purpose and priorities. If teams are left to figure things out on their own by inference or conjecture, they are more likely to veer off target, pursue conflicting agendas, and delay or make poor decisions. How fast will the M&A integration proceed? When should integration planning start? What are the critical priorities? Will communications be open and transparent? Will a formal M&A integration methodology be followed? What will be the approach to managing cultural differences? How will teams collaborate and report? Will lessons learned be documented and disseminated? In this section of our website, our books and articles cover the guiding principles that are the foundation of PRITCHETT’s world-class methodology. And our presentations provide examples of the M&A integration principles adopted by our clients. Even though every company and deal is different, following a proven set of guiding principles can dramatically improve the odds for integration success. Learn when key people most often jump ship in a merger and how to keep them on board. 10 crucial rules to follow. A wait-and-see attitude is reckless. Status report on how well M&A integration guiding principles are being followed. What are the M&A Integration Guiding Principles in the Area of Preparation? A Field Manual for Management. A Crash Course on Merger Integration Management. 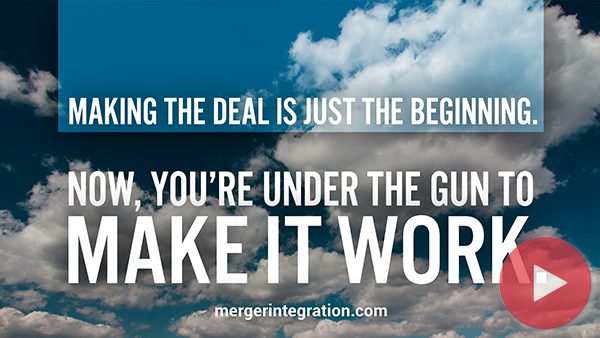 A Guide to Managing Mergers and Acquisitions.